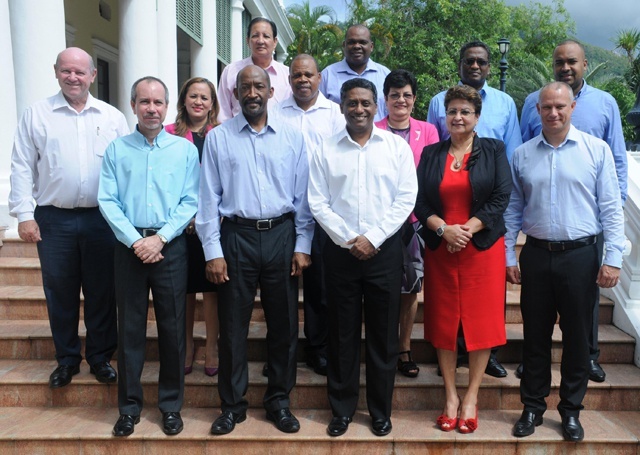 (Seychelles News Agency) - The Seychelles President Danny Faure on Saturday announced the make-up of his new government, assigning government ministers to their ministries. The responsibilities of 11 ministers were revealed during a special meeting at State House, in the capital, Victoria. Jean Paul Adam, formerly Minister of Finance, Trade and the Blue Economy, will now be heading the Ministry of Health and Social Affairs. Dr. Peter Larose an outgoing World Bank official and the newest minister to join the Seychelles cabinet, will head the new Ministry of Finance, Trade and Economic Planning. Mitcy Larue, formerly the Health Minister, is the first woman to head the Ministry of Internal Affairs. Charles Bastienne, who was in charge of Home Affairs, is now responsible for the new Ministry of Habitat, Infrastructure and Land Transport. Idith Alexander is moving from the Ministry of Labour and Human Resource Development to the new Ministry of Youth, Sports and Culture. Wallace Cosgrow, previously Minister for Agriculture and Fisheries, is now the Minister for Employment, Entrepreneurship Development and Business Innovation. Michael Benstrong, who was in charge of the Ministry of Investment, Entrepreneurship Development and Business Innovation, is now the new Minister for Agriculture and Fisheries. Alain St Ange keeps the portfolio of tourism, as he takes on the new Ministry for Tourism, Civil Aviation, Ports and Marine. Didier Dogley also retains the portfolio of Environment, Energy and Climate Change. Joel Morgan, formerly Minister of Foreign Affairs and Transport, was announced as the new Minister of Education and Human Resources Development. Designated Minister Macsuzy Mondon, who was the Education Minister, will now hold the portfolio of Local Government. Christian Lionnet who was the Minister for Land Use and Housing in the since March 2012 does not feature in the new cabinet. State House announced in a statement Saturday evening that Lionnet has decided to leave the government to join the private sector. "The President thanks Mr. Lionnet for his loyalty and dedication during his tenure and wishes him the very best for his future," reads the statement. In his address to the National Assembly two days after assuming the presidency, President Faure announced that his government would feature 12 ministries. In Saturday’s meeting he announced that one of them -- Foreign Affairs -- would now fall under his office, along with the Department of Public Administration, Department of Legal Affairs, Department of Defense, as well as the cabinet of ministers. The office of Vice President Vincent Meriton on the other hand, will oversee the Department of Information, Department of the Blue Economy, Department of Investment and Industry, Department of Information, Communications and Technology (ICT), Department of Risk and Disaster Management until it becomes an autonomous organisation. The Vice President's office will also be in charge of Civil Society and all issues related to religious denominations and also inner and outer islands. President Faure also announced that the Designated Minister Macsuzy Mondon will be the one responsible for the different portfolios whenever the respective ministers are overseas. He described the team under his leadership as one that should serve the country and Seychellois people. The Seychellois Head of State said that other senior appointments will be announced starting Sunday evening. Les Seychelles célèbrent la créolité dans toute sa splendeur,.